The Dead Ball Era, as the name suggests, was a period in baseball history characterized by low-scoring games and a lack of home runs. This age in baseball began in 1900 and lasted until Babe Ruth came onto the scene as a power hitter in 1919. Prior to Ruth, the game was more strategy-driven, featuring hit-and-run plays and base-stealing over hitting for power. In 1908, the lowest-scoring year, teams averaged only 3.4 runs per game. “Small ball,” as it’s known today, relied more on speed and quickness than on brute strength. 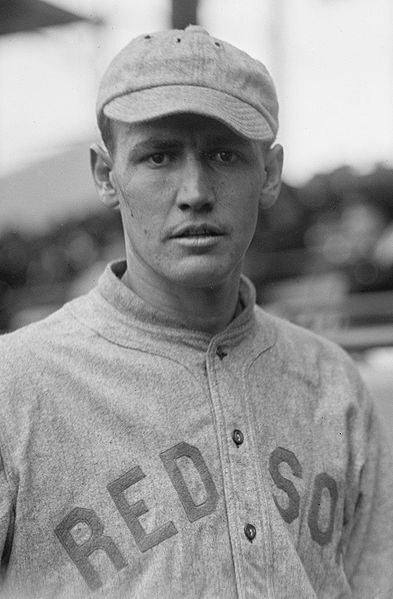 Players like “Smoky” Joe Wood, Eddie Collins, and Sam Crawford flourished during this time. Many baseball fields of the age were much larger than modern ballparks. Chicago’s West Side Grounds, for example, measured 560 feet to the center field fence. Huntington Avenue Grounds in Boston measured 635 feet to the center field fence. By comparison, most ballparks today don’t measure much more than the requisite 400 feet to dead center, which makes a huge difference for a player’s ability to swing for the fences. The state of the baseball throughout the game also contributed to the lack of home runs. The same ball was used throughout the game — unlike today, when even a tiny smudge on a ball calls for a new replacement. As the game would go on, the ball would become dirtier and dirtier, making it more difficult for hitters to see and hit. No doubt the extra dirt also contributed to the dynamics of the baseball’s movement. Speaking of which, during the Dead Ball Era, pitcher could still legally throw a spitball. “Doctoring” the baseball in this way would alter the physics of the flight of the pitch, causing it to break or move in unexpected ways and making it more difficult to hit. Naturally, pitchers took advantage of this concession. And it wasn’t just the spitball: the emery ball, shine ball, mud ball, so on and so forth. Got any creative ideas for defacing a baseball? Give it a whirl and see what it does! The umpires won’t stop you. On top of low-scoring contests, during these years, professional baseball also experienced turbulence through the births of baseball organizations outside of the National League. In 1900, the American League, which had been a minor league prior to this year, declared itself a Major League. Refusing to continuing recognition of the terms of the National Agreement, the AL now moved teams into cities already claimed by the NL, such as Philadelphia, Boston, and Baltimore. By 1902, the NL realized it would be better off accepting the American League, rather than fighting against it. A three-man National Commission was created to resolve the disagreements between the two leagues. Major League Baseball prospered and the World Series was born. The birth of the Federal League in 1913 threatened this new-found prosperity. It launched an anti-trust lawsuit against the AL and the NL, which drained the two leagues of resources. Like the AL before it, the FL moved into already-established Major League territory, seeking to carve out its own place in Major League Baseball. In the end, however, the level of play in the FL did not match that of the other two leagues, and FL teams merged into the other Major Leagues. The outbreak of World War I also proved detrimental to baseball. Baseball became viewed as a frivolous, non-essential activity, and seasons were shortened due to the wartime atmosphere. Attendance at ballgames dropped and the leagues lost money. The resulting drop in player salaries made them more susceptible to the promises of gambling, and created an environment in which things like the Black Sox scandal could take place. The end of the Dead Ball Era came with the end of the factors that contributed to its existence in the first place. The elimination of the spitball in 1920 had a profound effect on players’ ability to hit the ball, as pitches became less lively. The death of Ray Chapman in August 1920 changed the rule about the same baseball being used throughout a game, and clean baseballs became a staple in order to ensure the safety of players. Naturally, clean baseballs were also easier to hit. Additionally, the rise of Babe Ruth as a power hitter resulted in a change of attitudes in baseball. Ruth proved that a man could be successful in baseball by hitting home runs, and that the game was no longer restricted to “small ball” play. From 1900 until Ruth’s emergence, there were 13 seasons in which the league leader in home runs collected fewer than ten dingers. In 1919, Ruth hit 29 home runs — a league record. Other players followed his lead, and baseball scores steadily increased as the years went on. Frankly, the title “Dead Ball Era” seems a bit unfair to me. In today’s game, fans have come to expect home runs. If a player isn’t at least collecting extra-base hits on a regular basis, he receives little or no recognition. However, it seems that a game driven by strategy would be much more captivating than the slug fests of today’s contests. Bunting, the hit-and-run, and base stealing would have their due as meaningful parts of the artistry of a baseball game. Baseball would be more like a chess match and less of a display of muscle and power. Furthermore, because they were so rare during the Dead Ball Era, home runs, when they did happen, were surround by a greater sense of excitement than they are today. I would rather have the Dead Ball era than the DH the NL has to use at AL parks. Playing Strat-O-Matic baseball really brings out the difference in the two leagues. Pinch-hitters become rare. And, of course, double-switches are essentially non-existent in that league. Dull! True, there’s a lot more planning and strategy involved in NL play. The rumors about bringing the DH to the NL always make me nervous. I actually like how the two leagues do it differently, that way we always have the two different styles. Follow-up: While doctored baseballs were ruled illegal as of 1920, established pitchers in the majors already known to throw them were allowed to continue to do so for the remainder of their careers. Thus, the last legal spitter was thrown by Burleigh Grimes in 1934. And you have a great site!